The Gran Prize Innovative Interdisciplinary Award is an annual prize awarded for outstandingly innovative solutions, papers, and projects in response to the most pressing issues in the field of environmental protection, sustainable development, design, education, medicine, health preservation and development. The Award was established in 2012 by the Swedish Chamber of Commerce in memory of Carl von Linné, Swedish botanist, physician, and zoologist, one of the most acclaimed scientists in Europe, also considered one of the fathers of modern ecology. The Gran Prize aims at popularizing the values and attitudes held by Swedish companies in Hungary and stimulate innovative thinking. The prize can be awarded to any progressive person, company, association, institution, student or team of students. 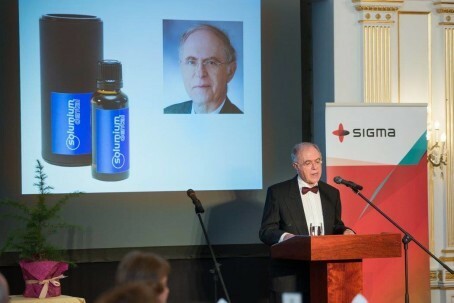 This year`s Gran Prize winner became Dr. Zoltán Noszticzius with his medical product Solumium — a local disinfectant, which can be used on the outer and inner surfaces of the body (on skin and wounds, or on mucous membranes of the body like mouth or throat), and can actually replace antibiotics in these applications. This project fully met all seven aspects that the applicants should comply with: novelty, social responsibility, sustainable thinking, environmental care, economic potential, technological aspect and interdisciplinary approach. Sigma Technology, a long-term partner of the Swedish Chamber of Commerce, and Ericsson sponsored the event. “Sigma Technology pays great attention to sustainable development. Events like Gran Prize are of great importance to us, as they contribute to creating favorable social conditions and establishing a better tomorrow,” says György Nagy, Country Manager at Sigma Technology Hungary.